The LIDIS (Less Invasive Distal Interlocking System) module is used for interlocking distal holes in cannulated intramedullary nails. 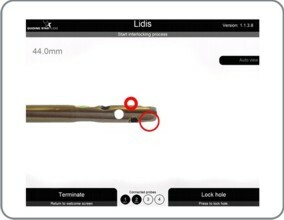 The Guiding Star navigation platform with the LIDIS module enables the surgeons to perform the distal interlocking of cannulated nails. The tracking technology provides continuous monitoring of the nail holes position. Using the LIDIS module the amount of radiation exposure is reduced to minimum. It can be used with all types of cannulated nails.